Tuesday evening: Clear sky. Mid 30s. Tuesday night: Clear and cold. Lows in the 20s. Wednesday: Sunny and cool. Highs near 40 coast, 40s inland. High pressure continues to build over New England for mid-week. Overnight lows will fall into the 20s across southern New England and in the teens or lower to the north. As the center of high pressure passes over us Wednesday afternoon, our wind relaxes. Seabreezes will keep the coastline around 40 degrees for Wednesday's highs and the mid-40s farther inland with plenty of sunshine. The high moves east by Thursday, allowing for a wind direction change. Gusty south winds and mostly sunny skies Thursday will boost our temperatures into the mid-50s. Northwestern New England may see a couple showers late as a cold front heads in. 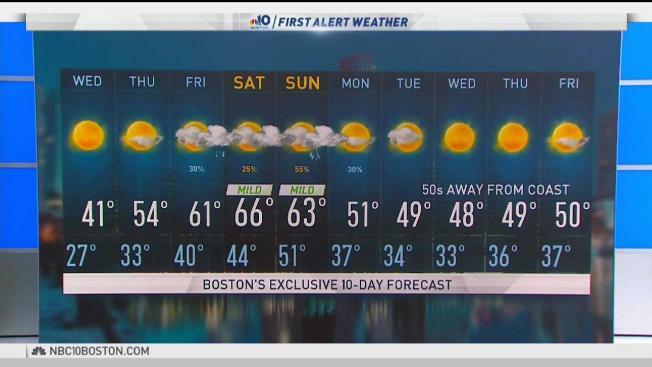 More warmth is on the way for Friday with highs around 60 degrees, but there's a chance for a few showers as a cold front approaches southern New England. This boundary is expected to lift north on Saturday as a warm front, so our temperatures will heat up with the gusty southwest wind Saturday. We're expecting 50s across the North Country, 60s everywhere else, but a few communities could overachieve and hit the low 70s. The cold front sweeps through Sunday bringing widespread rain, but after we hit highs in the 50s. Scattered showers linger in Monday's forecast and we cool to highs in the low 50s. Our average high in Boston by April 1 is 50 degrees. Next Tuesday will be the coolest day with highs in the upper 40s, but not too cool as we head into April. Temperatures stay in the low 50s for the rest of our 10-day forecast. In fact, we're expecting above average temperatures for the rest of our spring outlook.